I love New York, 🗽 exploring and spending time with my family. The adventures I post are great for families, couples, groups or flying solo. Most importantly, they can be terrific mini vacations- day and weekend trips. My reviews include ways to save money at attractions, projected costs, travel info. and a commitment rating. ❤️❤️ See my full reviews at 🚙 www.newyorkfamilyadventures.com. 🚗 My site now also includes Tiny Home Adventures 🏠. and fun things to do along the East Coast of the US! Carpe diem! We Spent Thanksgiving at Galyn's! We watched the 1st Sunrise on Black Friday! A National Treasure, Natural Beauty! 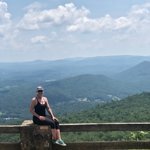 5 Mile Hiking Loop with 2 Mountains!